Norwex Mop System Review - Is it worth the cost? 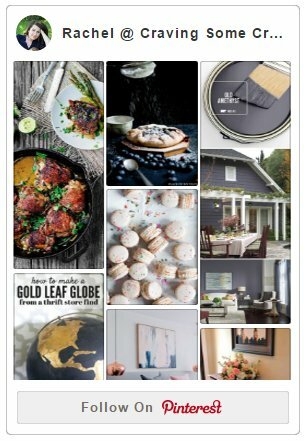 Truthfully, my house is never as clean as all those styled Pinterest photos. I have dogs, kids, DIY projects, and the general messes of life. I really have to work to keep our home clean. And the floors are the worst! 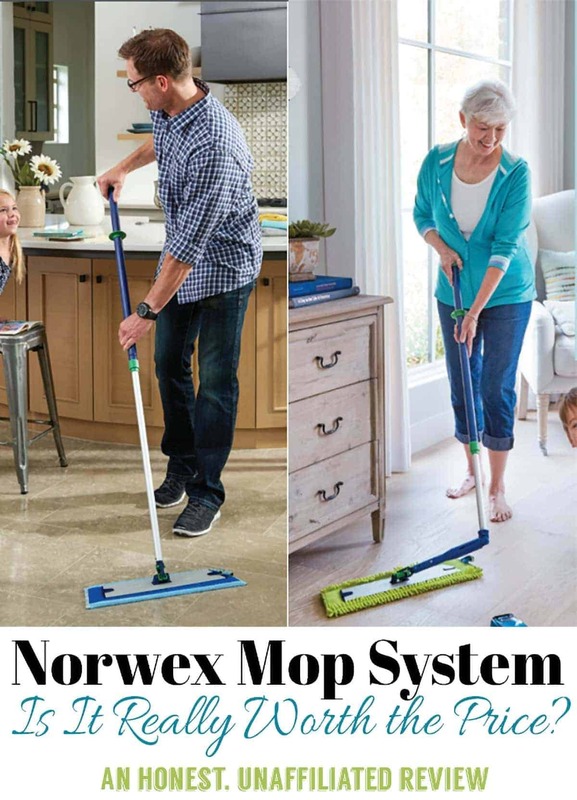 So, several months ago, when I found about the Norwex Mop System, which promised to make cleaning my floors easier, healthier, and cleaner, I was pretty ecstatic. And frankly, after receiving so many questions about my Norwex Cleaning Cloth Review, I wanted to take some time today to talk about another very popular collection – The Norwex Mop System. I have been using this mop system for about 6 months and while I always share my honest opinions, even in sponsored posts, and I have even turned down products I don’t love, I have chosen to write this post as an unaffiliated post. I am not affiliated at all with Norwex, e-cloths, or any other company. I want everyone to be able to read this Norwex Mop Review and decide if the products would be best for them, because the answer may not be the same for everyone! First, if you are looking here, you probably already have a consultant or know someone who is. If you don’t, you can still order online here. If you do order and use Rachel’s Party, I may one day earn enough for some laundry detergent, haha. My neighbor is a consultant, but I honestly get nothing for this review. For me, the reasons I write these posts are not to make money, I just like helping people with my experiences and after finding very few unaffiliated reviews on the internet, I decided to write my own. We just put in luxury vinyl tile in the kitchen. Also, about a year ago, we put in brand new dark solid hardwood floors. They are beautiful! We have two sweet, large breed dogs. While Pepper is probably an average shedder, Crash is the single worst shedding dog I have ever seen in my life. Per follicle, he’s worse than huskies, german shephards, and even my mom’s Bernese Mountain Dog. Did I mention that both of our dogs are white?! Every single hair shows on those dark hardwoods floor. And that’s not all. We are a busy family with kids, muddy paws, and cooking every night. We pretty much abuse our floors. I have gone through several systems of trying to maintain our floors. Of course, I try to brush the dogs daily, but let’s be real here, I would say it’s a 50/50 thing. I use a rhoomba daily, and that picks up about a cup and a half of hair each day. The rhoomba helps to keep the floors good enough until mop day, but there is still a fair amount of dust and hair even with that. I also usually sweep the kitchen every other day and vacuum our rugs weekly with our vacuum (which I highly recommend for hardwood/combination floors!). I also hand mopped and dusted with this microfiber mop and I had a few refills. Why do I have both sizes you ask? One of my main complaints prior to Norwex was how awkward it was to get around the rugs on my hardwood floors (pictured in my dining room above). After receiving the large mop system, I got a smaller mop head in order to make cleaning around rugs easier. Is the Norwex Mop Worth the Cost? After I received my Norwex Mop, I knew right away this was the best mop I had ever used! When compared to my $22 mop ($14 mop plus $8 refill), it noticeably outperformed. The dirt literally stuck to the mop head and I watched it pile up in the front as I mopped (which is oddly satisfying I must say). I could pick the dry mop up easier to take outside to brush off without hairs flying off as I walked. I truly feel like the mop head can be used for multiple days in a row, if I brush it off outside. I do have one note about getting under furniture below. Norwex Systems are designed to clean with only water. This is great to keep our kids and pets from crawling on chemical laden floors. The mop does seem to hold water more evenly without being sopping wet. It only needs to be slightly damp and I am not worried about any damage even on our solid hardwoods. The Dry Mop is great at picking up even the tinyiest dust particles and it seems to get into crevices between our boards well. Unlike my previous dust mop, the dirt piles up in the front and doesn’t fall off the sides as you mop. I can pick up the mop off the floor gently and brush it off outside without dust and hair flying off as I walk. There are different pads designed to do different jobs, and they excel at those jobs rather than as a one size fits all pad. Both my old microfiber mop and the Norwex mop are much better at getting tiny particles of dust and hair off of the floor than our vacuum. However, the Norwex is just a bit better with the tinyiest of tiny particles. The pole of the mop base is FANTASTIC. It’s adjustable height so it works for my 9 year old son and my 6’4″ husband. You can place the handle against a wall and it won’t fall over or mar the wall! the pads are washable in the washing machine and dried on high heat in the dryer. This is a huge cost savings over disposable pads like the swiffer. The telescopic mop base also has an attachment where you can use your window cloths to clean very high windows. The mop pads attach with a high quality velcro. It won’t fuzz and wear over time like some other velcros. It is also very easy to put on and peel off. The mop stystem has a locking mechanism that works with the push of a flip-down button. If you don’t lock it, the base swivels in every direction – handy for getting under your furniture. If you flip the locker down, the base doesn’t swivel anymore. Although my previous mop fits under furniture, you can not lay it on the floor without the pad popping up. With the norwex mop you can, making getting under furniture and awkward spaces a breeze! Although they have a great 2-year warranty, most people I know say that this mop lasts much longer than 2 years. Based on customer experiences, this mop lasts much longer than just two years though. The norwex mop system is an all-in-one system. 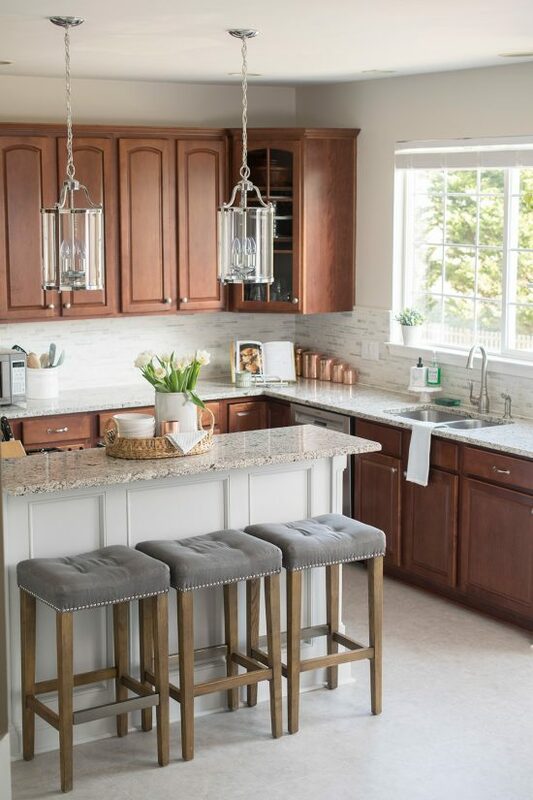 Meaning that you will only need one mop handle for multiple different jobs including hardwood mopping, tile mopping, dry dusting, and even high window cleaning if you purchase the accessories. If, like me, you want two different sized heads for cleaning tight spaces or large spaces, that is also still only one mop you have to store. Unlike my previous microfiber mop, I haven’t felt the need to purchase additional refills of pads. I have 1 pad for each job and that works well. The big one: the cost. To be honest, even I balked at the cost. Now, if you are currently using disposable mop pads, you will actually save money. The mop will pay for itself quicker than you think. Once you get your hands on one, you will proably start collecting accessories. I did at least. The rubber brush is FANTASTIC for pet hair on couches. I have had some trouble adjusting the telescopic pole for different heights easily. Final say- Better, but not $90 better. That being said, I do LOVE my mop and I absolutely recommend it in certain instances. How I got My Norwex Mop System For Free! Despite my disdain for these types of sales tactics, I did in fact host a Norwex home party, mostly because I had three friends who were already wanting to purchase items they tried previously in my home. I mean they really pulled my arm, lol. As a host, I received rewards from the purchases of my friends and, honestly, those rewards were extremely generous. In fact, for about $550 in sales and 5 purchasing friends, I received over $200 in products for free. $200! I received the Norwex Mop System because I had over $500 in sales, and I also received $54 in credit towards my own purchase. Should you Buy the Norwex Mop Stystem? In the end, that all depends. It is a very high-end mop, and it will last for many years, plus it has a great warranty. The cost is much less than all those disposable refill pads and floor solution, but I feel that the Norwex Mop is not that much better than my other microfiber mop to justify an extra $80-90. That being said, I do prefer my Norwex Mop overall because I only need one mop to do around the rugs as well as large spaces, and to dust and mop all of our floors. Those who want to eliminate chemicals in their home. Those who want a 1 mop system that can do all types of floors, and both large and small areas. Those who can confidently host a party to receive enough rewards to earn the mop for free. Those who want the best convenience and the most clean, no matter the cost. So if you are on the fence, or just tired of spending hours cleaning floors, I truly hoped this helped. Let me know if you have had any experience with this mop system or if you have any questions below! If you Liked this article, check out our other cleaning reviews and tips! Small Bathroom Organization Ideas You Will Love! I was told not to use water on my hardwoods. I have dark wood which shows foot prints from stocking feet and smudge marks. I would like like to try your mop with my current product. Is that possible? I completely understand your pain with dark hardwoods, as I have them too. I have solid hickory hardwood floors, and I use Bona or a light water spray with my norwex mop. It’s not that you don’t want to use water on hardwoods, it’s that most people would use an excessive amount of water, like a mop and bucket. If the water seeps down the sides, then you have a problem. What I usually do is walk around with a sprayer bottle on a light mist setting and spray as I mop. The mop head is misted as well to start with, but not soaked. Hope that helps! They have several different mop heads. I do find the orange head can be hard to push damp if you put pressure on it. I generally use the orange head dry and the wet mop (blue head) very lightly damp on my hardwood floors. The blue head is easier to push but sometimes if I pick up the head and move it, the head will flip over so I am a little more careful of that. It’s not bad, I just have to pay attention. I use the tile mop on my tile floors, but honestly I don’t find any extra benefit to that one over the regular blue wet mop. The tile mop isn’t super scratchy but you could ask about that one. It doesn’t seem to have as much suction as the regular blue wet mop head. FYI, Norwex is Direct Sales not MLM. So obviously she isn’t a consultant or she wouldn’t have stated the wrong type of company. I think we have a difference of opinion, although I am definitely not a consultant. According to Norwex’s own FAQ – “You can earn Norwex shopping sprees by sponsoring new Norwex consultants! And if you build a team of consultants, you’ll earn a percentage of their sales, as long as you are still actively selling Norwex and working your business, too.” Earning a percentage from consultants (usually referred to as a downline), is, in my opinion a multi-level marketing company. However, Norwex does require that you continue direct sales, not just recruit. I had my last Norwex mop for 20 years. It’s awesome. I just recently bought a new one, so with that being said, it is definitely worth the money. Thank you for taking the time to write this. Wow! It’s actually reassuring to hear that Norwex has been in business that long, because I hadn’t heard of them until about 18 months ago. It also means they have been standing behind their products for a long time. I was surprised I hadn’t heard of them before then, because some of their products are borderline magic. Thank you for teaching me something new! I find it hard to believe that you are just a consumer that found a great floor product and was so happy about it that you put together this entire “add” just to share your joy of this product. It sounds like you have a very busy household yet you find the time to write this article, insert links etc., and rant and rave about this product line! I gather this is one of those “Party Products” and that you are somehow affiliated with the company or receive kickbacks. Ouch, but I understand. There is so much on the internet that is not what it seems, but I can assure you that I must conform to Federal Trade Commission standards in reporting any relationship that I have with a company. I have no affiliation with Norwex, and purchase my own products at full cost. While my neighbor is a consultant, I wrote this review because I had trouble myself deciding what to purchase when I first heard of Norwex. I do honestly rave about several of their products to my friends and family (and even list a few I don’t like in another post). I also buy them as Christmas gifts. That being said, I felt this review of the mop system was very balanced. In fact, in this very article, I conclude “The cost is much less than all those disposable refill pads and floor solution, but I feel that the Norwex Mop is not that much better than my $20 microfiber mop to justify an extra $80-90.” I appreciate your honest viewpoint and skepticism of articles on the internet- we need more who think like that! However, I am a very real person, a mom and wife and I keep so many balls in the air for my busy home-remodeling family, so I appreciate products that can help me with all my juggling efforts. Thank you for your comment.